John Taylor has always loved gardening. A native of Flagstaff, his career path always included some form of gardening or landscaping. He worked in nurseries and as a private gardener for about 10 years. “I did ecological restoration work on the lower Colorado River,” he said. In 2009, Taylor developed an interest in education as more schools were looking for support in sustainable practices. Taylor is concerned that a lot of kids don’t spend that much time in nature and don’t develop a relationship with nature, which he says helps them in every other facet of their lives. An instructor in the Ponderosa High School gardening program, Taylor has cultivated a $2,500 grant from APS and the Phoenix Suns to enlarge its already existing irrigation project that captures and stores rainwater for irrigation. Using money from the grant, the students will use a 1,500-square-foot section of rooftop to design and install a larger system that will harvest rainwater that will be stored and later used for a landscape projects. The 75 students involved will learn about weather patterns, energy, water and soil and the physics of effectively moving water. The goal is to move water from the roof collection area and send it to a high point on the property using 1,800 gallons more captured water for their orchard and food garden, he said. “The $2,500 covers the key step we need to get there,” he said. The award was announced in early November 2017 and the expansion project has already begun. The grant is part of a $50,000 pot given to schools state-wide to inspire the next generation of STEM (science, technology, engineering and math) professionals. A gardener by trade, Taylor started a non-profit organization called Terra BIRDS, and was contracted by Ponderosa High to head up the gardening program. Terra BIRDS educates and empowers youth through gardening to help prepare them as the stewards of a sustainable future for humanity. The organization is committed to outdoor, experiential learning that addresses health and happiness, sustainability, STEAM education and the environment. It does this by developing and maintaining school gardens, supporting teachers and striving to be positive leaders for young people. Taylor says the dedication to gardening he witnesses from the students is nurtured by becoming acquainted with nature, the environment and the community that surrounds them. 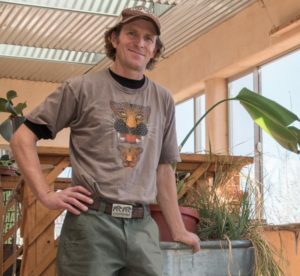 The project at Ponderosa started in 2010 when he built a small greenhouse on the campus. They have been doing this for the past eight years. Terra BIRDS is currently in more than 12 schools with similar projects all at different stages, with four paid staff members. “Kids of all ages love being outside and having gardening spaces,” he said. “The benefit of these garden programs is that it helps young people get outside and get their energy out. They develop teamwork skills, critical thinking and problem solving. It is good exercise and kids like the idea of growing their own food,” said Taylor. “I very much value the open spaces and public accessible land,” said Taylor. “I have a basic respect, love and relationship with nature. Taylor and his wife, Erica Sareio, an artist, are raising their son, a sixth grader. What was your last guilty pleasure? Who inspired you to do what you do? What character trait do you admire most? John Taylor is cultivating STEM skills and a respect for nature in his students at Ponderosa High School. Is it My Fault That Company Morale is Terrible?